Pearls are the only gems that seem to illicit one of two responses from people - an illuminated smile or a disapproving shake of the head. I have always found it interesting that these gems create such opposing reactions. I hope to provide some thoughtful information which may help turn some of you into pearl appreciators. Pearls are humankind’s oldest gemstone. Throughout the ages they have inspired myths, legends, superstitions, and even health remedies. Calling pearls 'gemstones' almost seems wrong, however, they are considered part of a group of gems in the Organics category. This group also includes coral, jet, and amber, but pearls seem to take the crown. There is something about their luster that is seductive, mysterious, deep and alluring. In 1917 Pierre Cartier paid for what is now known as the Cartier Fifth Avenue Mansion in New York City with two strands of ‘natural pearls’ that were valued at a million dollars. It’s rumored that Cleopatra dissolved or crushed a pearl in vinegar and drank it. Pearls have been referenced throughout ancient mythology, folklore, and even biblical scriptures. Amazingly, the oldest-known gem that was worn as jewelry is a piece of pearl that dates back to sometime around 520 B.C. In the early 1900’s-1950’s the desired pearls were the perfect, round, white pearls worn as choker-length necklaces or stud earrings. They are often too classic and traditional for most of our clients. The ideology and image of women of this time also has an influence on how we perceive pearls. Food writer MFK Fisher’s book Consider the Oyster is a loving tribute to these mollusks in which she includes a ‘recipe’ for making Japanese pearls. Ingredients required among other things include: 1 healthy spat, 1 mature oyster, an unnamable wound-astringent and a diving girl. Prep time: 10 years with seven years close supervision and “about a one in twenty chance of owning a marketable pearl”. With MFK Fisher’s witty recipe illuminating the considerable time, labor and risks involved in making a pearl, it’s no wonder they are revered worldwide. These beautiful curiosities have always held a mysterious allure for both jewelers and wearers owing to the surface’s subtle glow from the nacre - the crystalline substance that creates its unique iridescent visual effect. What seems to draw us to pearls is the beautiful, silky luster of a properly grown pearl. However, with the cost of pearls ranging from expensive to very inexpensive one can easily be confused as to what contributes to their value. What exactly is the difference between a ‘natural’ pearl and a ‘cultured’ pearl? How are pearls made? What are the different kinds of pearls? Here is a brief explanation of some of the more common pearls and their attributes, as well as our take on why pearls are so beautiful, and various ways to make them look artful and less traditional. Photos: Akoya Blue Pearls, Oyster Shells, Tahitian Pearls, South Sea Pearl courtesy of Cultured Pearl Association. 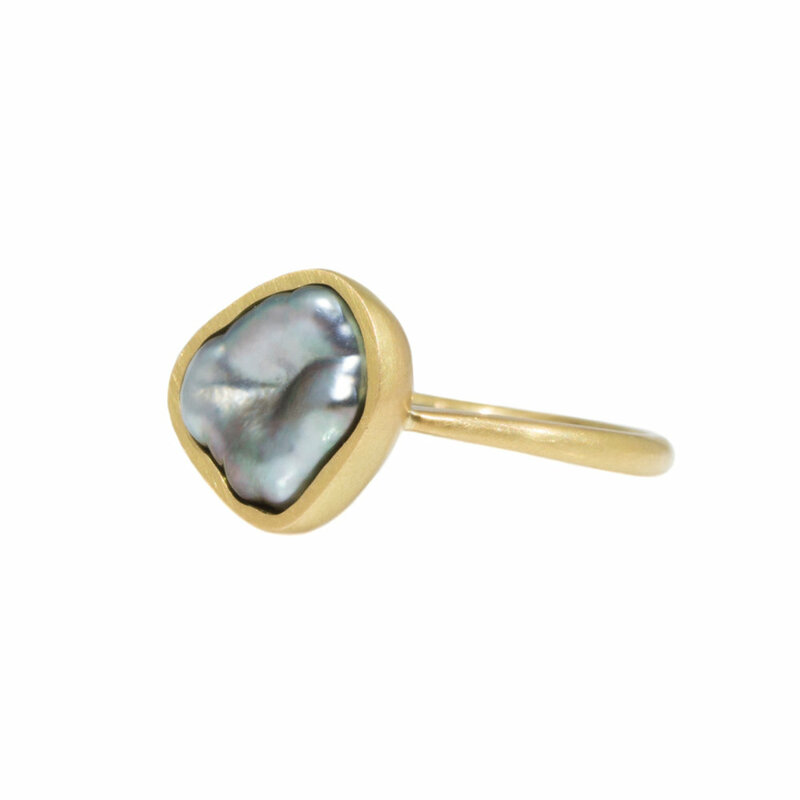 Natural pearls, or those found entirely without human intervention in an oyster or a mussel, are very rare. Your chance of finding a natural pearl in the wild is between about 1 in 12,000 and 1 in 20,000 depending on the location. Even if you were to find one, only a small percentage would be the size, shape, and color desirable for jewelry. Natural pearls are formed when an irritant such as a fragment of shell, a scale, or a parasite becomes lodged inside an oyster or mussel. This foreign matter then gets coated by the mollusk with layer upon layer of nacre, or mother of pearl, which is made of calcium carbonate. Prior to the early 1900’s pearls were extremely expensive and only available to royalty and the very wealthy. Then in the early 1900’s Mikimoto Kokichi discovered a technique for stimulating the oyster into producing a pearl. He is basically credited as the father of modern pearl culturing. (Government biologist Tokichi Nishikawa and a carpenter, Tatsuhei Mise, had been granted a patent for a grafting needle for culturing years before.) Although Kokichi applied for a patent to use a different method of grafting he eventually made arrangements to use the Nishikawa and Mise method and the cultured pearl industry expanded quite rapidly. By 1935 there were 350 pearl farms in Japan producing 10 million cultured pearls annually. Today pearl farming can be found in both freshwater and saltwater in many countries of the world including China, Japan, India, The US, French Polynesia, and Mexico. Saltwater pearl farming includes grafting a bed of oysters with a nucleus, typically a bead of mother of pearl shell and a piece of mantle (or the organic part of an oyster). The oysters are then allowed to grow the pearl for 2-6 years. Saltwater or ocean farming produces climate conditions that only oysters can live in. These oysters can produce some of the rarest and largest pearls on the market. In freshwater pearl farming, mussels are grafted with only the organic mantle tissue and not a nucleus or mother of pearl bead. Freshwater mussels are also allowed to grow the pearls for 2-6 years, however freshwater mussels can produce up to 30 pearls per culturing cycle whereas the saltwater oyster always only produces one. Traditionally saltwater pearls are generally more valuable for this reason. Pearl farms are required to adhere to strict government fishing guidelines. This ensures the long-term sustainability of the animal and the gem. Pearl farmers are motivated to keep the waters clean because only oysters and mussels that live in healthy waters will produce pearls. But as with any large industry you should work with galleries and reputable shops that you trust and have researched their suppliers’ practices. 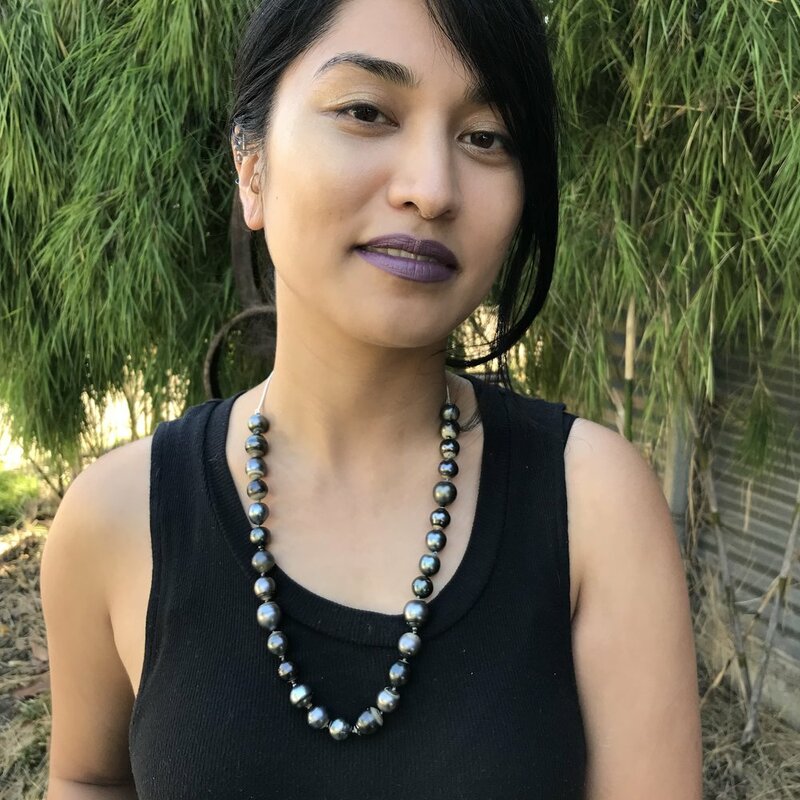 Photos: Anatomy of an Oyster: Pearls a Natural History, Oyster Shells, Tahitian Pearls, courtesy of Cultured Pearl Association. Round: Round pearls are perfectly spherical and the shape most people think of when they think of a pearl. Because of their relative rarity and ‘classic’ nature they are highly desirable. Near-round: These pearls are slightly flattened or elongated rather than being a perfect sphere. 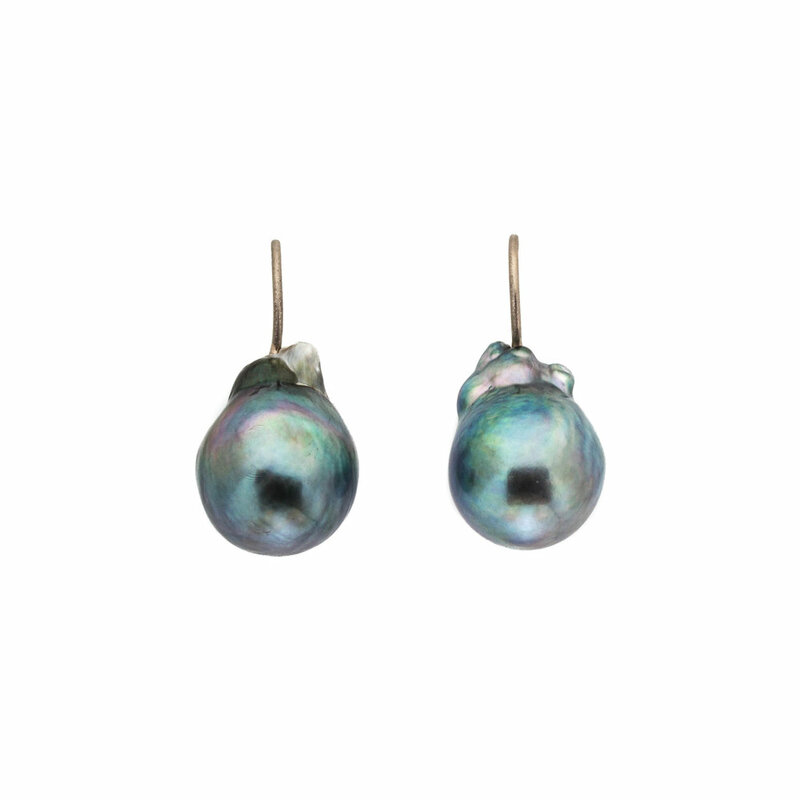 Oval: These pearls are shaped like an oval, narrower at the ends than they are in the center. Button: Button pearls are flattened to some degree making them resemble a button or a disk rather than a sphere. These pearls are often used in earrings where the flattened side can be attached to the setting. 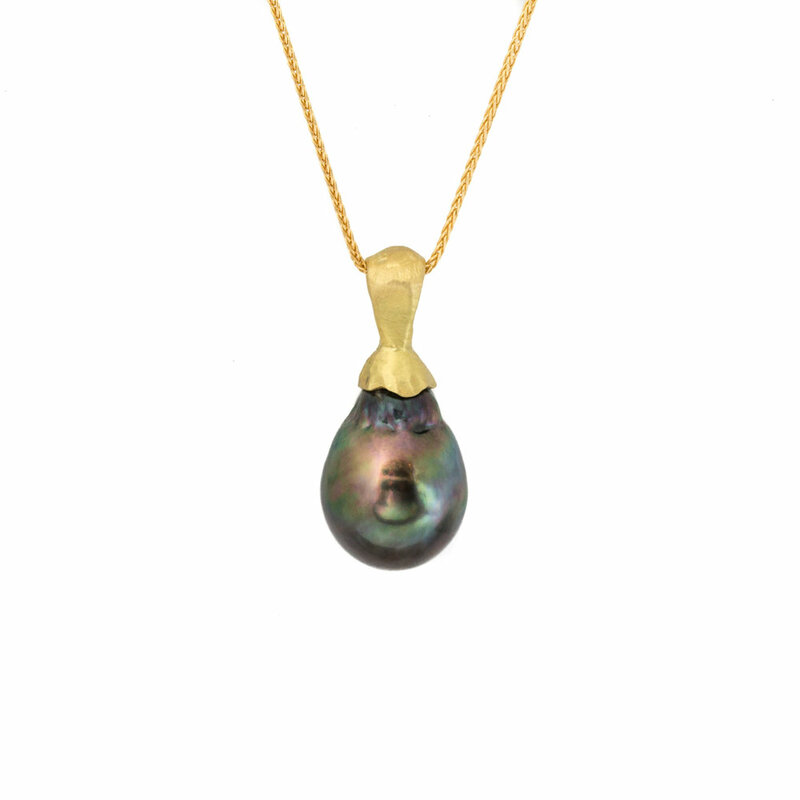 Drop: Drop pearls are pear or teardrop-shaped. The drop can either be ‘long’ or ‘short’ depending on its proportions. Semi-baroque: These pearls are slightly irregular in their shape and are not symmetrical. Baroque: This is a pearl that is both non-symmetrical and range from irregular to extremely irregular in shape. The baroque pearl can be purely abstract in its shape or it can resemble a cross, stick or some other form. Circle: A subset of Baroque pearls but as the name suggests they have visible ‘circles’ or ‘rings’ around the diameter of the pearl. Keshi pearls are small non-nucleated pearls typically formed as by-products of pearl cultivation. A Japanese word also meaning "poppy", it is used in Japanese for all pearls that were grown without a nucleus. Originally keshi pearls referred to those pearls formed when a bead nucleus was rejected. Mabe pearls are a type of large, usually hemispherical cultured pearl grown on the inside shell of an oyster rather than within the body. Because of it’s shape it is often mounted in jewelry. Dome of mother-of-pearl is the hard, pearly, iridescent substance forming the inner layer of a mollusk shell. Seed pearls are generally defined as a small, natural pearls usually measuring less than 2mm in diameter, although their early definition stated that they must weigh less than quarter of a grain. Seed pearls are formed when a foreign object enters the oyster or when the shell is damaged or compromised. April Higashi, Baroque Tahitian pearl, 18k yellow gold, hematite chain 34 1/2"
Baroque Tahitian, Keshi, Loave, Dome pearl jewelry by April Higashi, Kate Eickelberg. More info here. A pearl’s beauty lies in its luster; the brilliance, shine and glow of a pearl. The quality of the nacre (and in turn the luster) is affected by a variety of factors such as the cultivation techniques used, the health of the oyster, time of year harvest takes place, temperature variations, pollution, and the type of oyster used to cultivate the pearl. On the high end of luster, the pearls will have intense, sharp, almost mirror-like light reflections and there will be a high contrast between their bright and dark areas. Low-luster pearls will be milky and seem more like a piece of chalk rather than a lustrous pearl. There is very little contrast between light and dark areas. 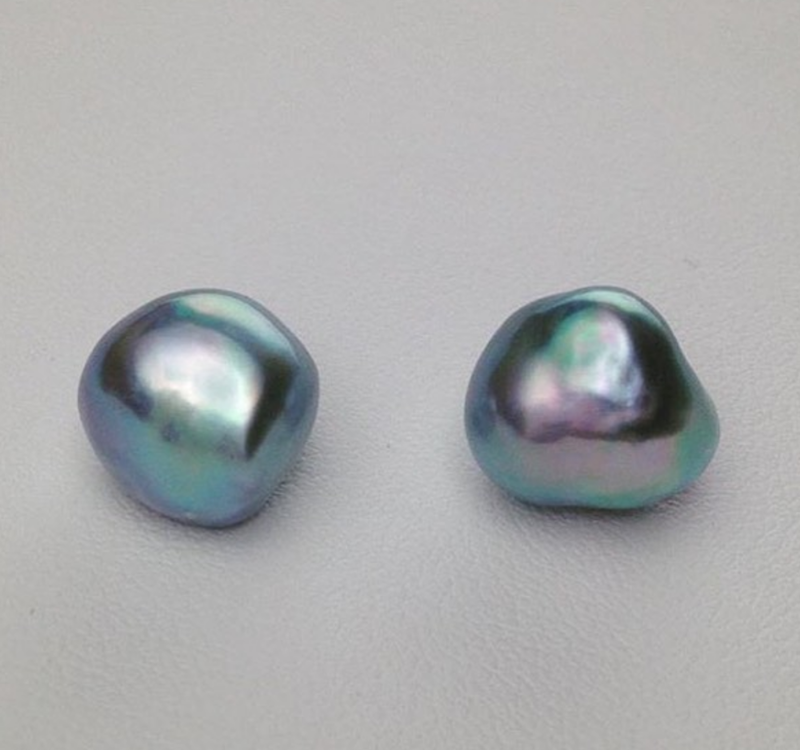 Pearl color can have three components: body, overtone and orient. The body color is the pearl’s dominant overall color. The overtone is one or more translucent colors that lie over a pearl’s body color. And the orient is a shimmer of iridescent rainbow colors on or just below a pearl’s surface. All pearls display body color, but only some show overtone, orient, or both. 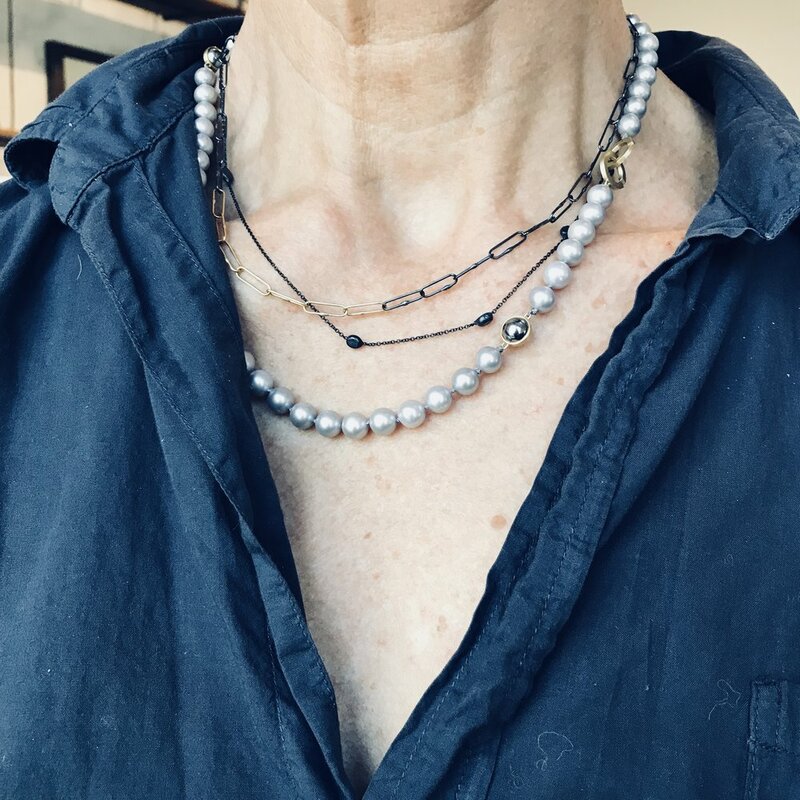 Photos: Mixed Pearls , Tahitian Pearls, Akoya Baroque Pearls, Golden South Sea Pearls: courtesy of Cultured Pearl Association. 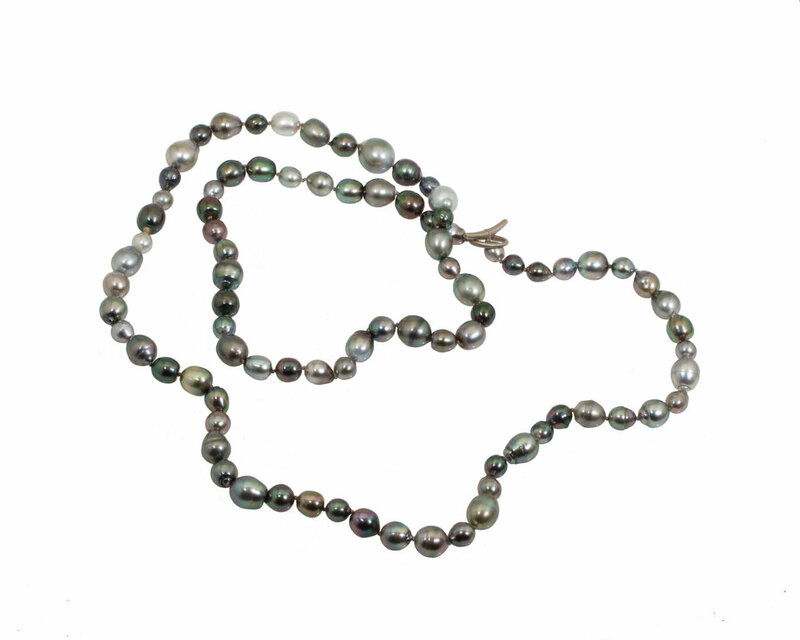 Strands of pearls are usually sold to jewelers as 16” - 18” lengths. 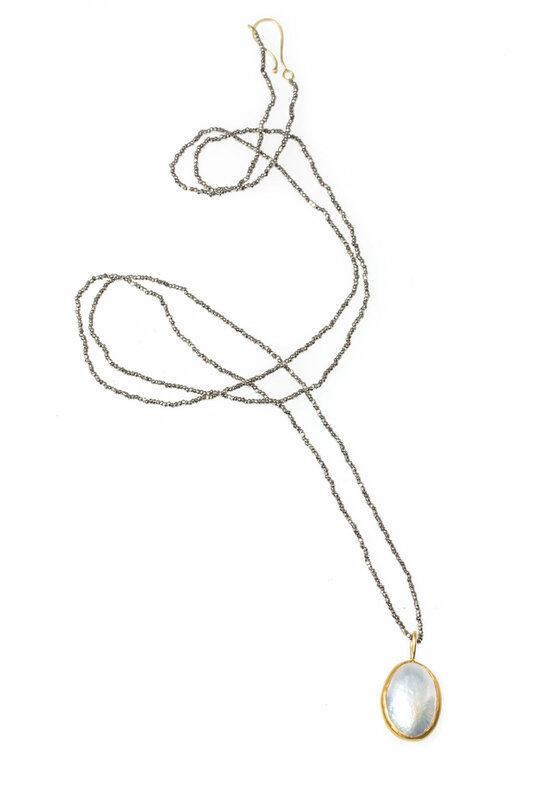 We find that adding to the length, either by putting two strands together or adding a chain at the back, makes them look less conservative. We also don’t usually ‘graduate’ the pearls, or have all the big ones in the front center gradually decreasing in size towards the back. We mix up the sizes and string them in a more rhythmic and organic nature. We’ve found that a contemporary clasp design or mixing in custom beads set with diamonds visually breaks up in the strand and compliment the pearls. 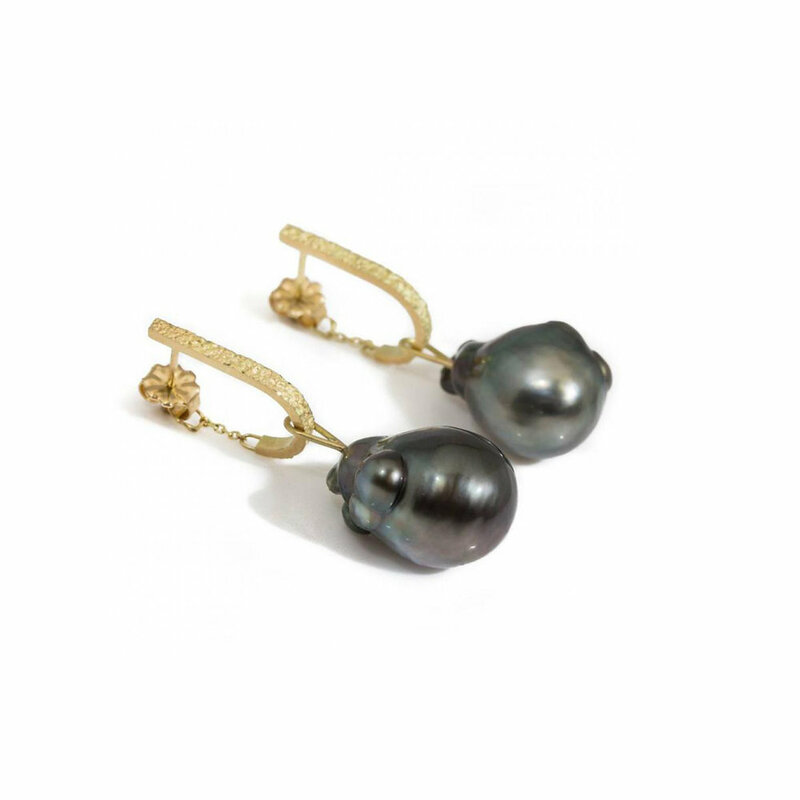 We also love pearls in organic shapes such as the Keshi and Baroque. It takes a good eye to match them and can take hours to do, but after that a simple embellishment can be best. April Higashi, large silver keshi pearls, silver chain. 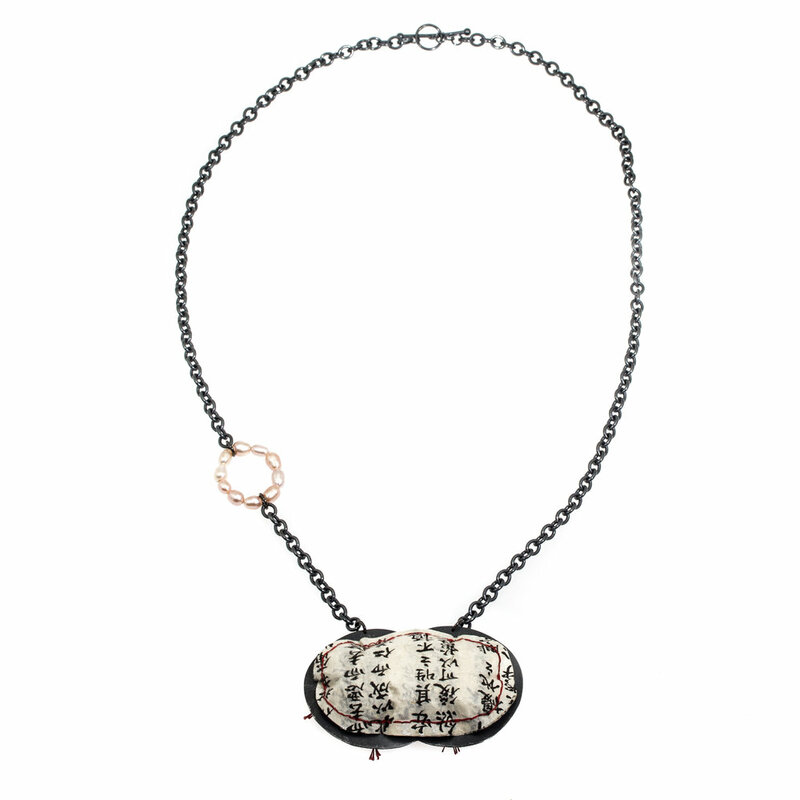 Keshi, Baroque Tahitian, Freshwater Pearl Necklaces by April Higashi and Kate Eickelberg. More info here or click on individual pieces. Matching organic shapes of Keshi and Baroque pearls that have similar luster makes the pearls more interesting to us than the perfect round pearl. Even when we use perfectly matched pearls we usually do something organic and unexpected to accent the beauty of the pearls. 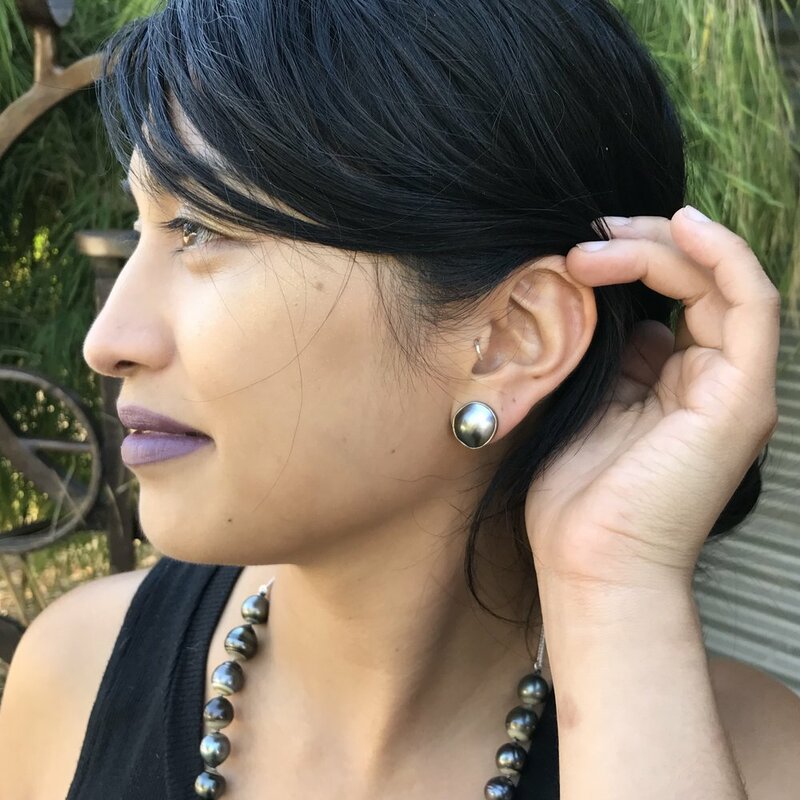 Blue Baroque Tahitian, Silver Keshi, Feather Pearl, Large White Baroque, Keshi, Grey Baroque Tahitians, Natural Pearls, Grey Mabe Pearl Earrings by April Higashi and Kate Eickelberg. More info here. 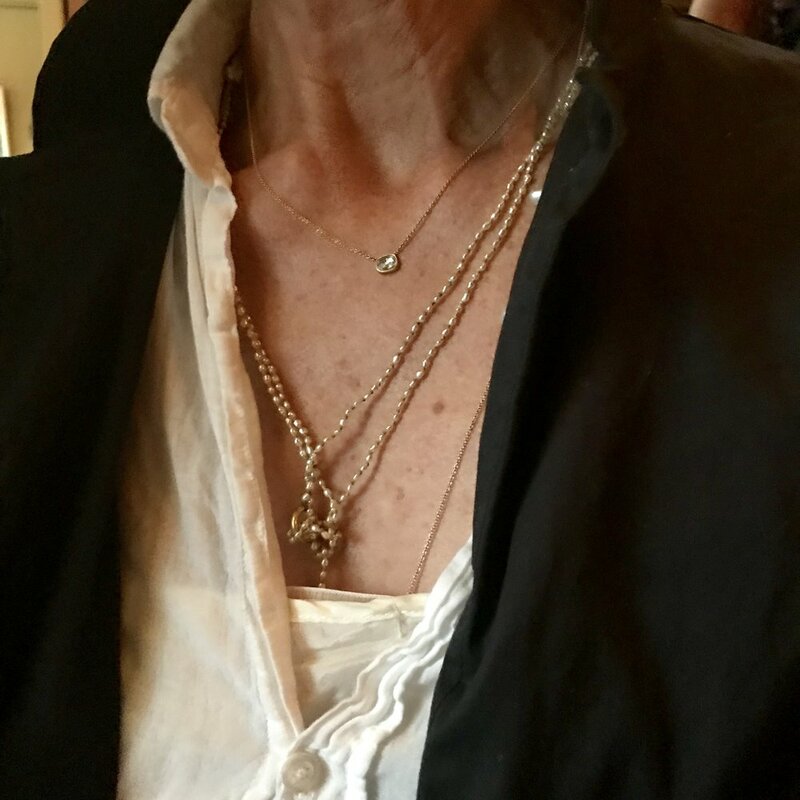 Layering your pearls can add a different dimension to the traditional. 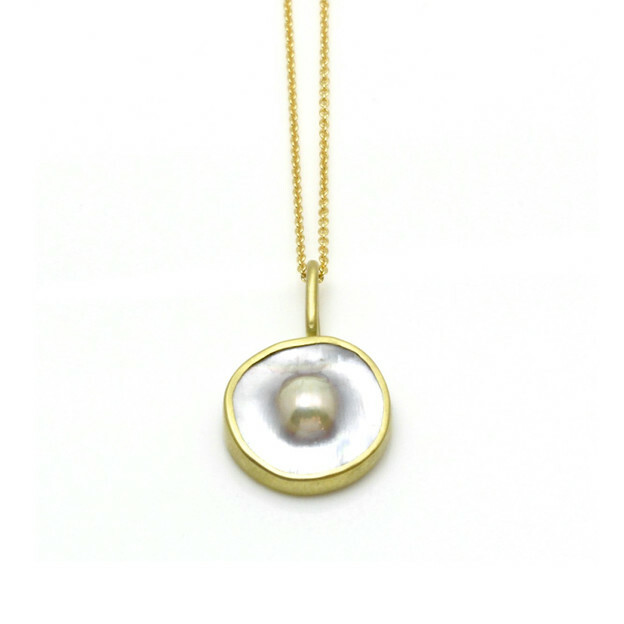 And a simple pearl pendant is a beautiful way to own a pearl and put it in the mix. 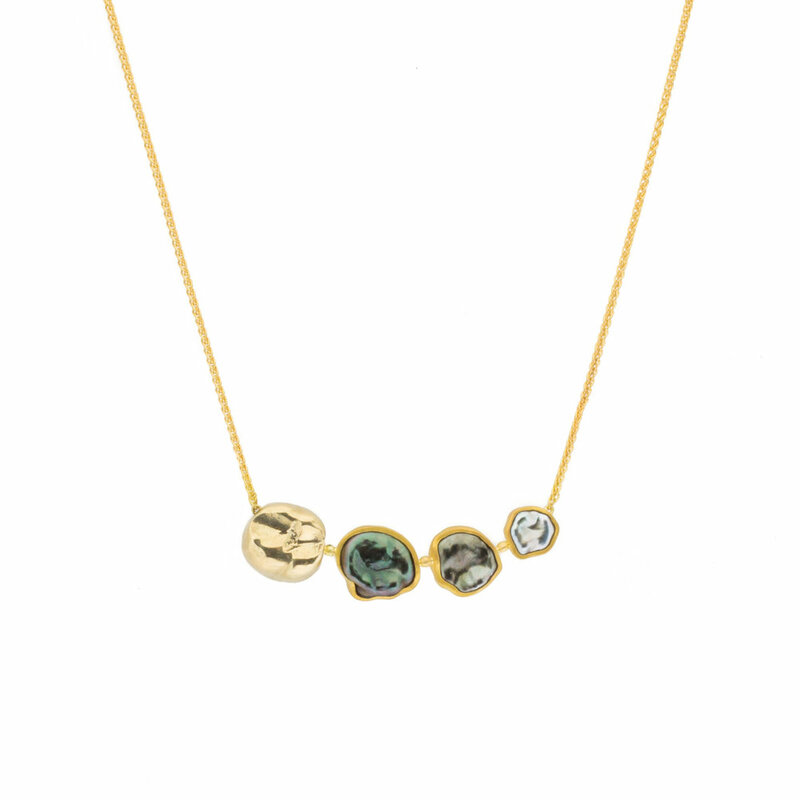 Above: Various Artists Layered with other jewelry. Some of the work can be found here. 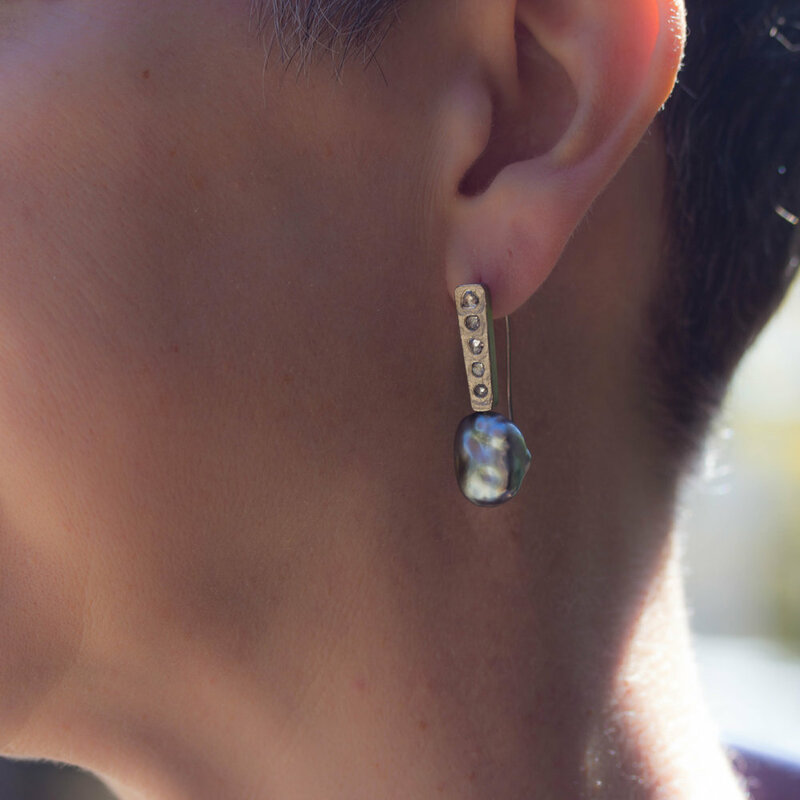 If you still feel like pearl jewelry is too traditional, try one last category. 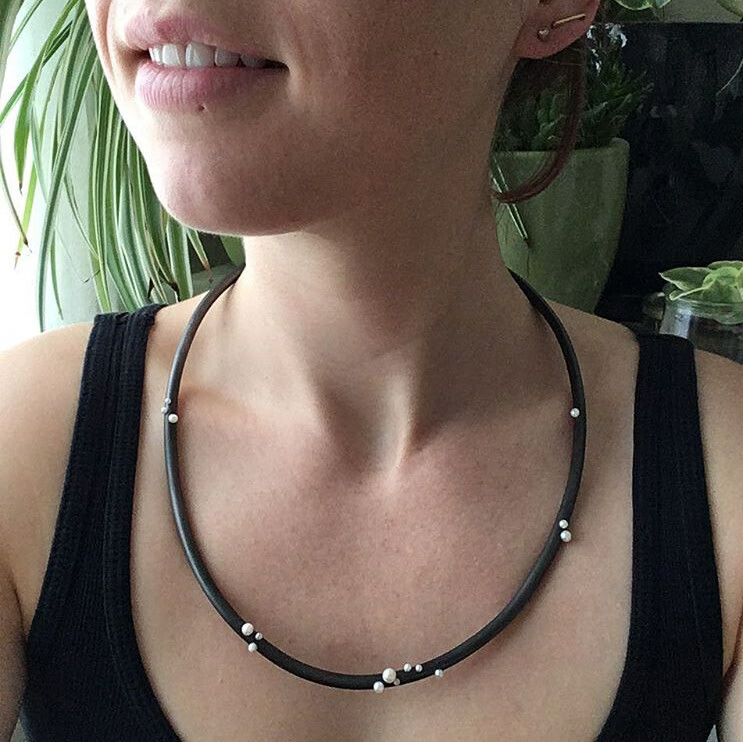 Art Jewelry offers alternative designs where the pearl is often used as an accent instead of being the main focus. It is about the design, concept, and meaning. Megan McGaffigan, platinum silver, tintype, twin baroque pearl, spinel, steel pin wire. Claudia Alleyne , silver, seed pears, silk, oxidized silver. 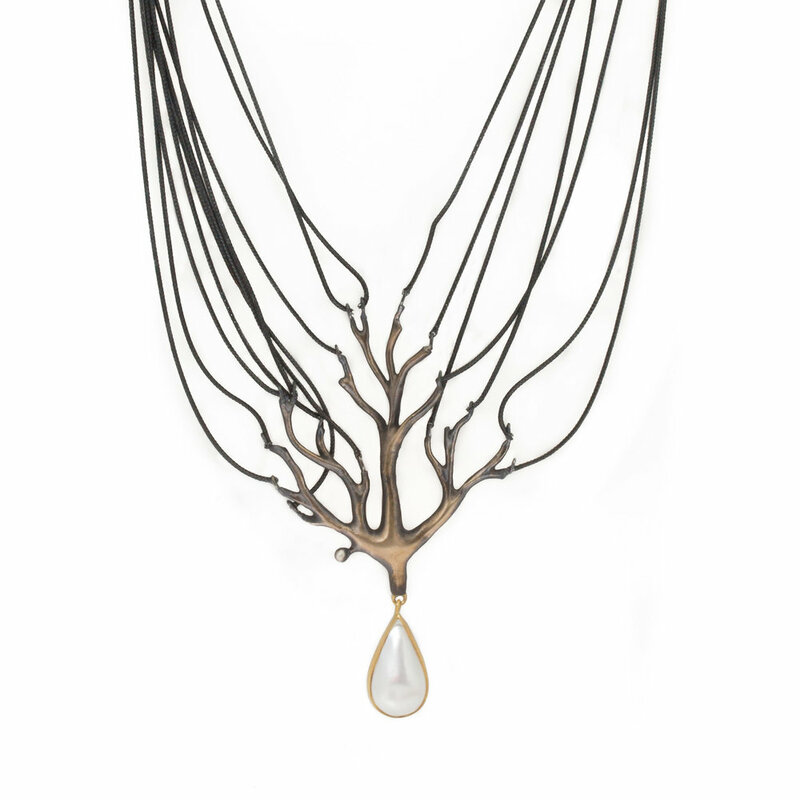 Above: Art Jewelry with pearls: Megan McGaffigan, Niki Uelha, Kiwon Wang, Nina Bocobo, Kate Eickelberg. More info here. Pearls are resilient and are meant to be worn, however, since pearls are organic gemstones they need slightly different care than non-organic gemstones like diamonds or emeralds. The golden rule we tell our clients is “last on and first off”. Pearls should not be worn when cosmetics, hairspray, fragrances, or sunscreen are applied. These products, even if they are natural or mineral based, can affect the luster of pearls. Pearls should not be worn when excessive perspiration will occur, such as during work-outs. Pearls should be stored in a cotton cloth bag and kept away from heat sources such as heating vents or fireplaces. Pearls should not be stored in plastic due to the chemicals plastic emits and the fact that pearls need air circulation so they don’t dry out.